The corridor of uncertainty: Is technology making us hyper-social? Our relationship with digital devices, especially mobiles, is a complex one. We love them and use them constantly to communicate, find information and organise our lives. At the same time we are aware of our over-dependence and have a nagging feeling that we have possibly gone too far. We worry about our children's technology addiction and propose banning mobiles from school, the one place where they could learn to use those mobiles more wisely. Many of those who propose such bans are extremely active themselves in social media and presumably seldom turn off their own mobiles. 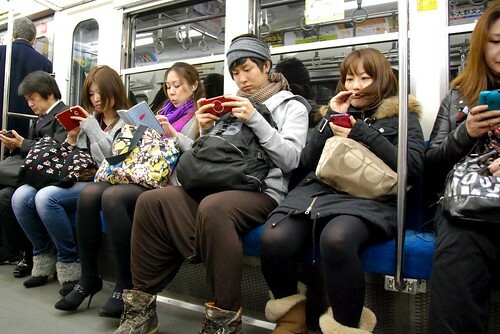 Some say that technology has made us less social but it seems that the reverse is true. Use of technology is often portrayed in the media as an addiction but the question is whether it is the technology or a particular device that we are addicted to or something else. A new study from McGill University in Canada, Hypernatural monitoring: a social rehearsal account of smartphone addiction, suggests that we are actually addicted to social interaction and that digital devices are simply channels for this need. The paper is also summarised in a post on the site Futurity, We’re ‘addicted’ to socializing—not our smartphones. While admitting that today's hyper-connected technology contributes to over-dependency, the authors' study indicates that our real "addiction" is the human need to monitor and be monitored by others. We thrive on acknowledgement and recognition and so every like, comment and message fuels this desire. Before digital media we were dependent on the greetings, smiles and nods we receive from family, friends and colleagues every day but now we have added hundreds more potential sources of recognition pleasure to that list. Digital technology magnifies and exploits an already existing need. Our brains' reward system is running on overdrive and that leads to addictive behaviour. The article stresses that the desire for social interaction is, of course, natural and that we need to become more aware of our excessive dependence on technology and try to control it. We need to discuss technology use more openly in classrooms, workplaces and at home and agree to common principles such as switching off the stress of notifications and developing attention strategies (switching off distractions when focusing on a demanding task). We also need to be more aware about how manipulative technology can be; that apps and tools are designed to be addictive (often referred to as sticky). Simply banning devices is just sweeping the problem under the carpet. We need to become more aware of the issues and how we can use digital devices and technology responsibly. If schools and colleges ignore this issue where else will we learn these skills?